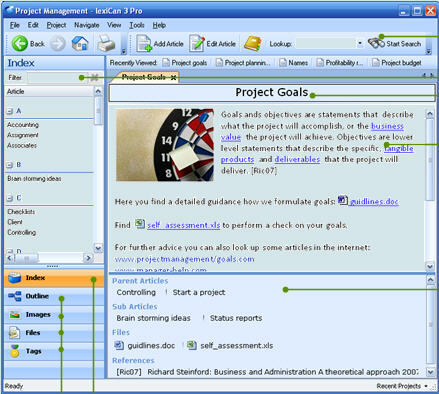 lexiCan is a powerful knowledge management and information organization software to manage and control your knowledge effectively and productively and organise all types of information which others can then access and use. Storing your information is easy - you simply create a title under which you can arrange texts, tables, images, files and references to web resources and other articles – everything can be collected in one place! The Smart Access feature then lets you access it quickly and securely. The full text search includes embedded files, or search by outlines, tags, A – Z searchable index, picture and file overviews. lexiCan is so flexible; it can help all types of information-flooded users to get organized! Companies can use lexiCan to communicate quickly and efficiently across their networks through knowledge bases or Windows wiki software. Scientists, researchers, teachers, lawyers, doctors can use lexiCan as a publication platform in a Windows network. Whatever their field of expertise, anyone organizing or publishing information can benefit from lexiCan's intuitive, hierarchical structure. It's never been easier to collect and share information within a Windows network. The easy-to-learn, robust lexiCan platform lets anyone in an organization create, collect, edit and share information with as few or as many users as they want. You don't need special training or hardware to use lexiCan. It's the ideal tool for creating knowledge bases to improve workflow and to share ideas and resources such as guides, tutorials, corporate manuals and white papers. More and more organizations are using corporate wikis to enhance internal knowledge sharing and collaboration between their team members. However the original Wikipedia format (using Wikimedia) is not as easy to use as many people expect. But, using lexiCan as a platform, it's easy to link people, projects and even customers. lexiCan Standard-Edition is free and lexiCan Pro-Edition is inexpensive and lets you manage unlimited projects. Both applications install within minutes. When professionals are working together on the same project, effective sharing of information is a key factor for success. Often you have to deal with a confusing number of files or complex tools to structure your information. lexiCan makes building a searchable file depository really easy by letting you use natural titles to connect your contents and one-click links from one page to another. With one more click you can publish all your documentation into one website, including all your file attachments. Many teams work from operational guidelines spread across a wide range of files. Others squeeze all the information into just one huge text document. Either way, it’s often difficult to access specific sections, to cross reference from one section to another or to add new information. Using lexiCan is the perfect way to compile and publish this type of manual. It's easy to cross reference information using drag and drop and there is multi-dimensional access to all the information via the full text search, tags, alphabetical index or outlines. Editors can quickly set up the manual using lexiCan Pro-Edition and readers can access it with just one click using lexiCan Reader. Conducting academic research for the publication of papers and texts is made easier with lexiCan. Articles can be produced in a variety of ways and, as you gather your information, lexiCan works in the background, letting you search any part of your project and its associated files. As you restructure or move your information around, lexiCan will keep track of it all including footnotes, bibliography, tables, figures and credits etc. Once the project is complete, lexiCan offers you publishing options including print and the internet. lexiCan makes developing the content and structure for a website really easy. Just take it step by step and move the contents around as many times as you need to. Then it only takes one click to transform your work into a real website! Are you a Windows software developer looking for a convenient way to compile help content? Or, maybe you just need to provide hypertext content that can be read easily on every Windows PC? Either way, lexiCan is the perfect tool. With just one click, content compiled using lexiCan can be exported as a Windows standard HTML Help File. Helping people has never been so easy! Organization: build your own corporate or personal lexicon. Superfast: instant access to information. Flexible: No forms, just the freedom to arrange information how you want to. Everything in one place: Gather all your information in one place – files, notices, mails, bookmarks, images etc. Powerful full text search: View results in seconds, including embedded files. Intuitive access: Use meaningful titles, cross links, tags and flexible structures. Easy cross links: Via drag and drop. No server required: So you’re up and running in minutes. Easy to use. No special skills required. is the the award-winning project management software for Mac OS X operating system! turns Outlook into a more powerful information management tool through database connectivity! is a sales and client information management system.